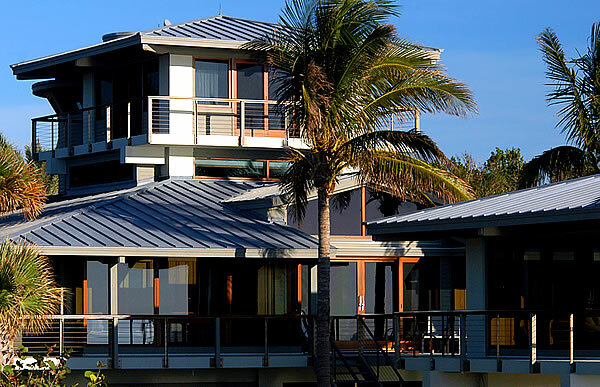 Standing seam metal roofs should be installed over a properly prepared roof deck. The wooden substrate below should be even, dry, and be at least 1/2 inch thick. Standing seam roofs can also be installed over purlins (horizontally running 1×3 or 1×4 furring strips) or over boards. It is also recommended to install standing seam over a roofing underlayment such as roofing felt (tar paper) or synthetic underlayment. It is recommended that synthetic underlayment is breathable, so it does not trap moisture, which can cause the roof deck to rot and mold / mildew can form, causing expensive repairs. Ice & Water shield is also not recommended for use under a metal roof, as it is first – not serving its main purpose, since standing seam metal roofs can pretty much stop ice dams in their tracks, without any deck damage, while the much glorified Ice & Water shield can trap moisture, and potentially cause mold and deck rotting issues on poorly ventilated roofs — where the deck is not allowed to breath due to inadequately ventilated attic space (which is sometimes the case in some houses), since the ice and water shield seals it off on one of the sides. In Northern New England states (NH, VT and ME), it is a common practice to install a standing seam metal roof over asphalt shingles. — This is done mainly for economical reasons, as a roof tear off and disposal can be very costly. This practice should be avoided, however. Standing seam panels will expand and contract with temperature changes, while the under-pan could be rubbing against the stone-coated surface of asphalt shingles. — This could easily strip off the paint and galvanizing layer on metal roofing panels and cause rust. When snow sits on a metal roof, it compresses the panels against the asphalt shingles, thereby creating horizontal dents on the panels, which could make your new roof look very unattractive, or should I even say – ugly. This is also referred to as “telegraphing effect”, when rows of shingles show through a metal roof. A standing seam metal roof is attached to the roof deck using fasteners (usually 1 inch wide head screws) and either clips or screws / nails installed through a nailing strip — a part of the panel formed when the metal panels are being rolled out. Nailing strip panels are faster and cheaper to install, but should not be used on panel runs over 15 feet, as expansion and contraction will cause buckling and “oil-canning” in the panels. Oil canning is the term used to refer to ugly bubbles that you can sometimes see on a poorly installed standing seam roof. 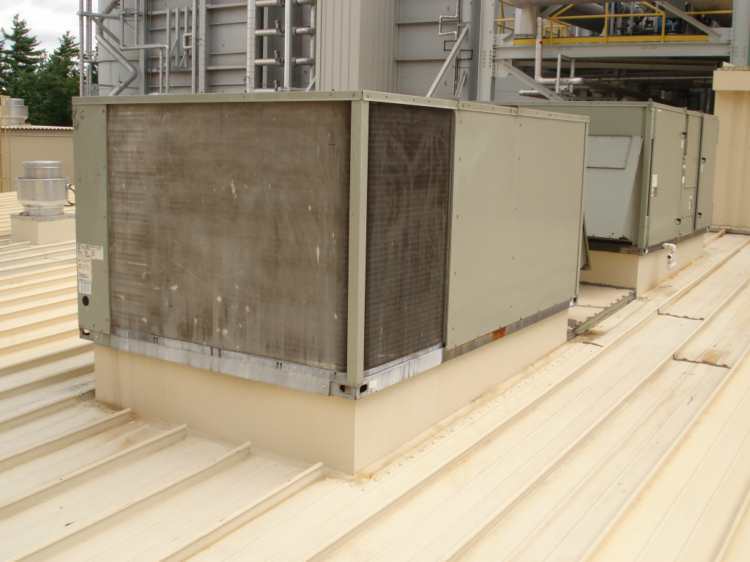 To prevent oil canning, you can have your standing seam panels made with special low profile stiffening ribs that are indented into a pan of each panel, during the manufacturing process. Another way to avoid oil canning is to install standing seam panels using special clips (this reduces the tension on the panel), and to install panels in mild weather, so it’s not too expanded or contracted at the time of installation, and of-course you need a more or less even roof deck surface. 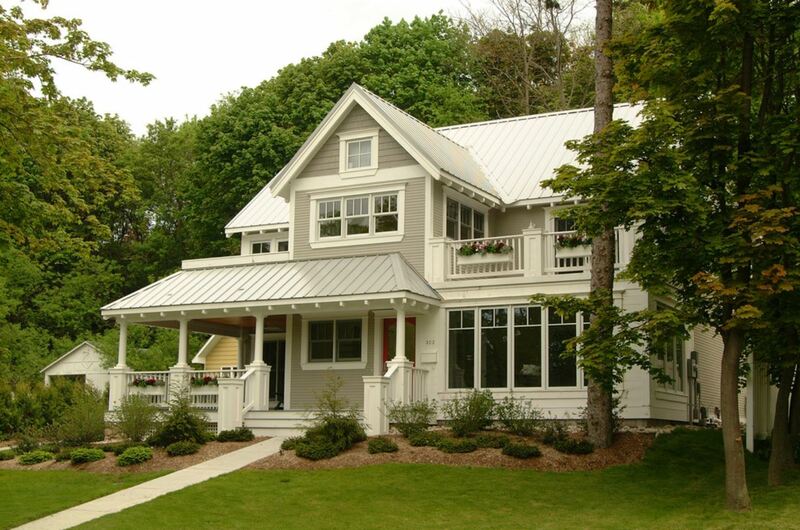 While standing seam roofs are very popular, they are rather difficult to install on complicated (complex and cut-up) roofs, with many dormers, skylights, valleys, etc. They can be very pricey compared to other systems such as metal shingles, shakes and stone coated steel roofing profiles. 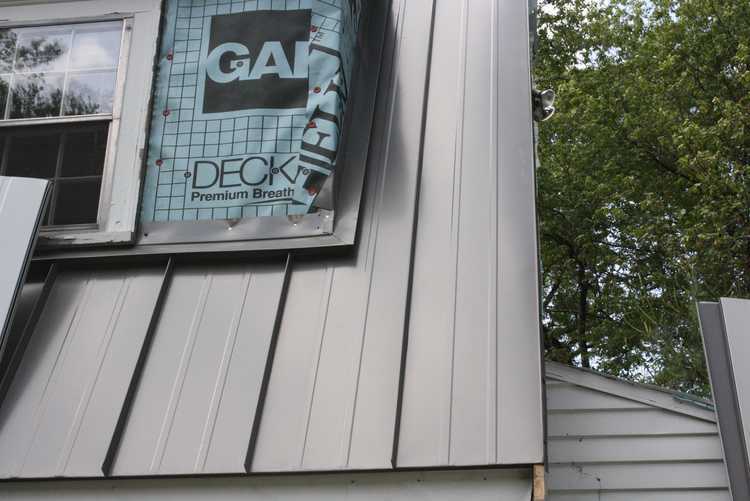 The difference in cost is mainly due to the difficulty of installation, high materials waste factor, and higher-premium materials cost for quality standing seam panels (please note that this not the same as 29 gauge, cheaper, thin-grade steel, acrylic-coated metal roofs that are normally installed by low-ball companies) made of high-grade Galvalume steel or aluminum. Because of the design of architectural standing seam, it is also rather difficult to install a roof penetration flashing for sky-lights and chimneys, as there is no one good flashing method, and you rely mainly on caulking, when it comes to water-tightness. 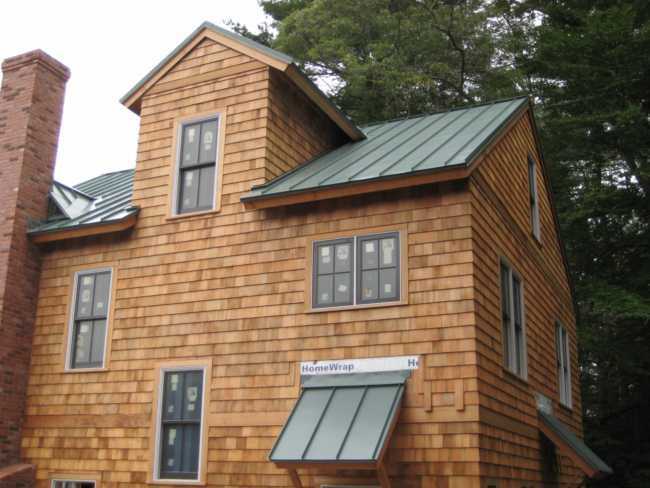 All of these factors complicate standing seam installation process and make your initial costs go up. The mechanical lock profile used on low-sloped metal roofs ensures that water does not penetrate through the lock between panels, if it sits above the lock. Some structural standing seam profiles that are made of steel with lower quality galvanic coating, and may begin to rust within 10-15 years, and may require a metal roof coating application. Metal roofs should never be installed on completely flat roofs, with no slope at all, as they are not designed to withstand ponding water and all joints on a metal roof are sealed using some type of caulking. Even the copper panels with soldered seams have been proven to leak on dead zero slope roofs. While, most interlocking metal shingle profiles can only be used on roofs with at least 3 to 12 roof slope, standing seam, can be successfully installed on many roofs with 1 to 12 roof slope (a roof with a very low slope), but you must use a mechanical lock profile to prevent any unwanted roof leaks. Standing-seam metal roofs over shingles is being considered down here in Miami with a Versashield fire barrier installed first. Great article!! I had 3 consecutive standing seam metal roofs installed, none of which worked. Mostly because of crooks, but also because of the complexity of our roof. The house had add ons several times. There are probably 6 roofs merging with 1 cricket and about 5 valley’s. I finally found an honest man that repairs the leaks a couple of times a year. Now I have saved enough money to hopefully do a somewhat permanent repair. He will take off the vulnerable areas, seal the decking and put the same pieces in the same spots. I have to say I am really nervous. This portion is 4,000 to repair. I am researching which is what led me to your site, to make sure he/I are putting the right material underneath. He says he is using the liquid sealer that is used in harsh conditions or on flat roofs. I live in Georgia, any ideas? It sounds like the roof slope might be an issue. 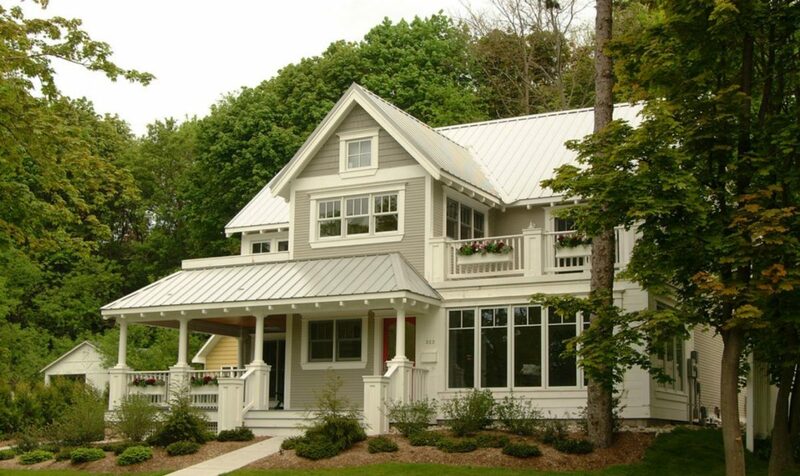 Generally standing seam require a minimum slope of 3/12, some profiles are rated for 2/12 slopes. Proper flashing and adherence to manufacturer’s specs is always a must with standing seam, especially on complex roofs. Not all installers have the know-how or are willing to do things by the book. That said, standing seam is generally a good option for straight forward roofs, not overly complex and cut-up roofs. The flat or nearly flat portions of the roof should be covered with either a PVC or TPO membrane, not standing seam. I was curious about your comment “Ice & Water shield is also not recommended for use under a metal roof”. We have a stone coated roof with several skylights on a vaulted ceiling. We need the skylights replaced, and from what I was reading, it is recommended that the perimeter and curb of skylight are covered with Ice and Water Shield to prevent water penetration of the wood. Is your comment referring to standing seam metal roofing only? Is it wrong to surround the skylight with the Ice and Water Shield due to concerns about trapping moisture between the metal roofing and Ice and Water Shield? I’m a bit confused how to properly prevent water from touching the wooden skylight curb aside from flashing and caulking. While we would not recommend using ice and water shield over the entire roof deck, it’s OK to use it sparingly, at the eaves, around a skylight, or in the valley. That said, flashing a skylight properly can be accomplished with the use of GAF deck armor breathable underlayment and metal flashing. There is no a “Must USE Ice and Water Shield” imperative. All the skylights we’ve flashed around during metal roof installations to date, have been wrapped with the GAF Deck Armor breathable synthetic underlayment, not Ice and Water shield.